Okay. Not many of us will make the list of those qualifying for the upcoming PGA 2019 Championship at Bethpage State Park’s Black Course (May 13-19). But that doesn’t mean New York isn’t full of serious golfers. There’s a reason, for example, that Long Island’s Bethpage Park boasts not only the acclaimed Black Course — but the Red, Blue and Green as well. However, serious golfers are not limited to New York. Here and elsewhere, they are passionate and always looking for improve their swing. 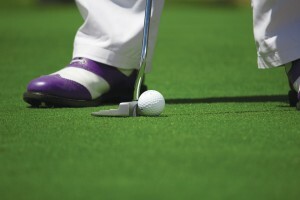 Well, did you know that golf experts believe you can improve your golf game with hydrotherapy? Indeed, a Golf Digest Fitness Advisor has pointed out that to improve one’s golf game “You need moist heat,” And moist heat, like you experience in a hot tub. is great before a game, as well as after. You might say: soak, swing, soak! You can read all about how a hot tub can improve your golf game in an informative Bullfrog Spas blog post here. Spending time in a hot tub can decrease pain and help improve flexibility by decreasing the effects of gravity, increasing blood flow, and by lessening the pull of tight muscles on sore joints. When you also take into consideration the added benefits of pulsating actions of spa jets on muscles and bones, etc., you can imagine how rejuvenating the totality of the hot tub experience can be. 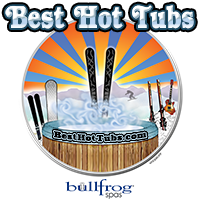 Here’s a video of a happy Bullfrog Spas customer where he’s sharing why he likes his hot tub so much and why Bullfrog Spas patented interchangeable JetPaks are a key part of Bullfrog’s superb hydrotherapy. Plus, because hydrotherapy also improves anyone’s cardiovascular performance, we find sports, including golf, easier to do. Of course, it is always common sense if you suffer from any of these problems to ask your physician what the right course of treatment is and how hot tub hydrotherapy can help. Hot tubs improve muscle health. Soaking in a hot tub loosens stiff muscles and reduces soreness. Increased blood flow to the muscles also aids in healing injuries and recovery after intense workouts. So, with spring finally upon us and golf season just around the corner, you might say the clock is ticking on muscle health. Our Best Hot Tubs teams (Westbury, Farmingdale, Windham, NY) are experts, and they’re available to share more about hot tub hydrotherapy and the health and wellness benefits of a hot tub.